Today’s always-on consumer is spread thin across multiple devices, browsers, and channels making it difficult for brands to gain customers’ attention. This has been a problem for quite some time as the proliferation of consumer touch points continues to grow. Turning quantity into quality is the first step in maximizing lead intelligence to reduce costs and provide positive customer experiences across channels. Capturing the full attention of your customers and prospects requires knowing who they are at the identity level. Not just where they live, but their demographics, interests, attitudes, and behaviors that all help tell a story to provide the necessary details to create personalized and relevant customer engagement. Neustar Lead Intelligence™ solutions allow businesses to identify and verify a prospect as soon as a connection is made. Using enriched customer intelligence built on a framework of authoritative consumer identity data, marketers can segment and score individuals turning a new prospect into a qualified lead. Neustar also provides marketers with automated decision making and workflow management solutions to activate against those qualified leads in realtime. This means shorter sales cycles and more relevant and targeted offers from initial point of contact to conversion. With the input of a single consumer identifier—including phone number, address or email—accurately identify prospects from any touch point in real-time, increasing marketing reach and scale. 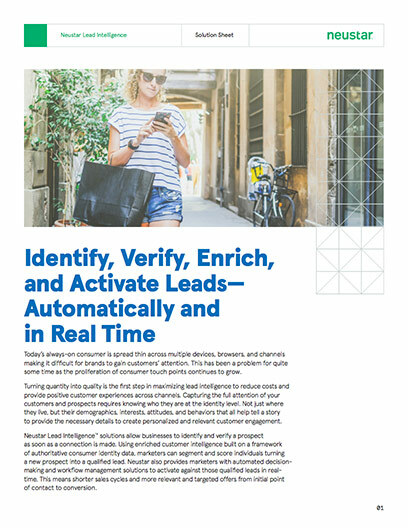 Verify and validate consumer records using Neustar’s authoritative identity, to paint a complete picture of your prospects’ actions across channels. Remove lead duplicates and qualify the best prospects prior to contacting or purchasing, reducing operational costs and waste. Enrich lead intelligence with predictive scoring that highlights consumers with the highest propensity to take action, helping you focus on the quality targets to increase sales and conversions. Go beyond the score with custom segmentation, delivering insights through the lens of demographic, attitudinal, behavioral, lifestyle and geographic attributes. Use these insights to drive strategic marketing activities, for a multichannel approach to your business. With minimal IT involvement, business users can create data flows that support better and faster decisions to accept or decline leads. Analyze, activate and automate the entire acquisition process with custom business rules and dynamic workflow management to improve operational efficiencies.